Alli McKee, Founder and CEO at Stick has a Bachelors from the University of Virginia in studio art. She has an MBA from Stanford. Her original oil paintings have been featured in a variety of publications and exhibits. She's spent almost two years in Africa creating new design thinking curriculum, and then a couple years ago she decided, "Well, what the hell, I'll just go back to the valley and I'll create a start up." It seems like we're focused sometimes more on the math [in marketing] or more on the quantitative and not enough on the design. Alli talks to us about the impact and importance just generally of good design in driving businesses today. Along the way, if you don't already know, find out what a "word wall" is. I think about creativity is that it's really just collecting things, collecting information, and putting it together in interesting ways. It's really not about having this creative talent, it's more having access to that inventory from which you can invent. So the way that Stick works is we're trying to give you a jumpstart on that creative process. It's built around this behavior that I've seen in real life as a designer working with business people, a lot of people, just like yourself, saying, "I'm not creative. I need help with this." But the second you give them a first draft, they always have feedback. Always. Right? So what we've tried to do is build that first draft into a tool. So you can put in your content, Stick automatically generates that first draft for you, and then enables you to act on that feedback in a few clicks in seconds rather than a two day email exchange. Listen in to see what doing improv has to do with sales and marketing... and a lot more! 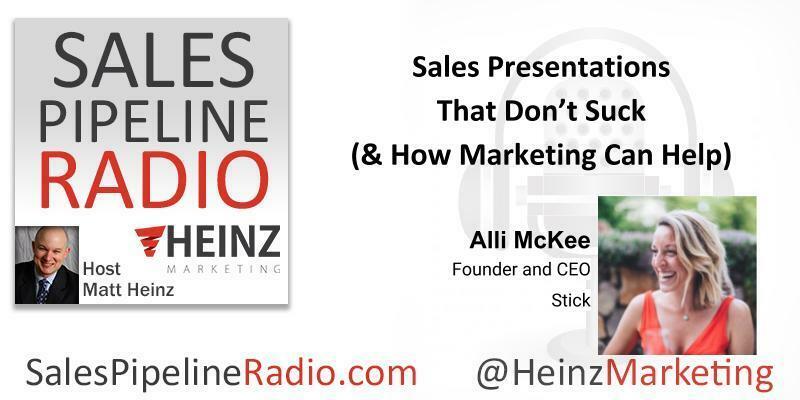 You can find the transcript and recording of this episode on the Heinz Marketing blog on Monday, 4/2/18.